Rockford’s minor league baseball team changed its name this year, morphing from RiverHawks to Aviators. The new name recalls the city’s bit role in aviation history. It wasn’t a bad choice. I suspect, however, that if birders had made the call, the Frontier League would now feature the Rockford Kites. Named after the birds of prey, of course, not the kites you buy at a store. My son and I traveled to Rockford in June. We watched the Aviators play on a Saturday night, followed by a round of mini golf at Volcano Falls. The next morning we focused on the real purpose of our mission: to see the Mississippi kites that have been nesting in a leafy Rockford neighborhood every year since 2008. They are known as the Bloom School kites because they frequent a city park adjacent to an elementary school. On Sunday morning we drove to the school’s parking lot to meet Dan Williams. A retired attorney, Dan is one Rockford’s top birders and now serves as board president for the Natural Land Institute, a Rockford-based organization that works to conserve and restore natural resources in northern Illinois. The process for finding the kites is pretty simple: go to the schoolyard and wait. However, as I learned from Dan, seeing the birds is never a sure thing. He knows birders who have visited Rockford and gone home disappointed. Many birders, like me, arrive at Bloom School without ever having seen a Mississippi kite. Outside of Rockford, the species is rare in this region. In DuPage County, kites have been observed drifting over the Greene Valley hawkwatch during fall migration. However, only four kites have been recorded since the hawkwatch project began in 2006; two of those were spotted last September. Mississippi kites are far more frequent in extreme southern Illinois, the northern edge of their traditional breeding range. But over the last 30 years their range has gradually expanded to the west and north. It is probably just a matter of time before a nesting pair is discovered in DuPage. Or maybe several pairs—the kites are social and typically nest in small “colonial” groups. The Bloom School area has hosted up to four nests at a time. Outside the margins of their usual range, kites often settle into parks, golf courses, cemeteries and residential zones. Suburban living agrees with them. That is certainly the case in Rockford, and birders are enjoying the opportunity to see kites up close. In fact, as Dan and I stood in the Bloom School parking lot chatting, he suddenly noticed an adult kite resting in the top of a Siberian elm, about 40 yards away. The bird had arrived without our noticing and stayed put for several minutes. Through Dan’s Leica scope we looked right into the red eyes of a pale-headed adult. At one point the kite vocalized, sounding a high-pitched call similar to a broad-winged hawk. ﻿﻿I was pleased to see a couple birds in the air, too. Kites have a distinctive shape and buoyant flight style. The wings are long and pointy; the tail is fan-shaped. If a kite is directly above, you’d never mistake it for a red-tailed hawk. As the name implies, kites are aerial specialists. Their diet consists mainly of large insects like dragonflies and cicadas, captured and consumed on the wing. Dan told me they occasionally prey on chimney swifts and swallows, too. That speaks volumes about the hunting skills of these graceful raptors from the South. It was a thrill to add Mississippi kite to my life list, and the sighting completed a personal grand slam. 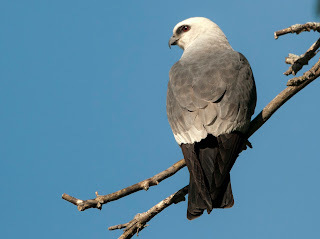 I’ve now seen four kite species in the United States, the others being snail kite and swallow-tailed kite (each spotted in Florida) and white-tailed kite (San Diego). 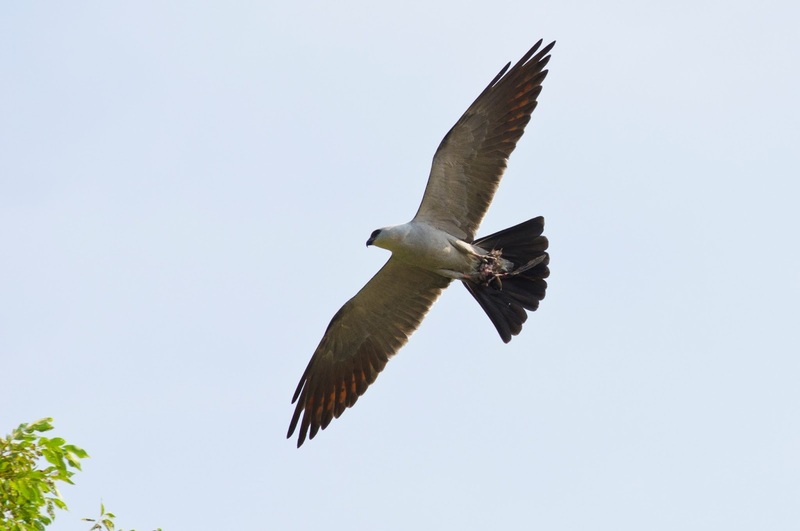 A fifth kite species, hook-billed, is possible along the Texas-Mexico border. In late August, when the Bloom School reopens for business, the kites outside the classrooms will be on the brink of migration. By mid-September they’ll begin their journey to Central and South America, where a ready supply of flying insects will sustain them through the winter. Until then, the show goes on in Rockford, where aviators of the feathered kind are raising their young. Tickets are free, and it’s only 80 miles away. You could even stay for a baseball game.